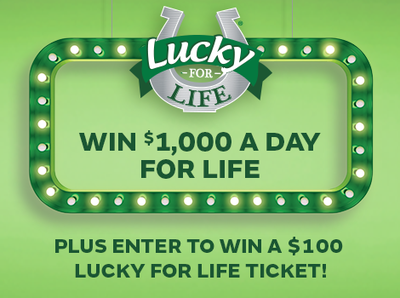 A $10 Lucky for Life Ticket Gets You Entered to Win! Purchase 5 Lucky for Life plays (on one ticket) dated April 15th through May 6th and you can enter to win $5,000 in the Lucky for Life Bonus Draw. Five prizes will be awarded, so get your entries in today. Entries must be submitted using the Colorado Lottery's mobile app and you must have a MyLottery account to enter. Simply scan the barcode on the top of your qualifying $10 Lucky for Life ticket and you'll be entered. It's that easy! Win $1,000 a Day for Life! When you play Lucky for Life you're playing for the chance to win the top prize of $1,000 a day for the rest of your life (match 5 + the Lucky Ball)! The game's second tier prize is for $25,000 a year, for life (match 5). Just imagine how your life could change for the better with a bit of extra cash in your pocket. Enter to win one of (5) $100 Lucky for Life tickets (2 sets of Quick Pick numbers for 25 draws on (1) ticket! Enter now. Entries Accepted: April 15, 2019, 4:30 a.m. Entry Deadline: May 6, 2019, 11:59 p.m.